This week's Sunday Night Suds looks at Saranac Brewery's Tropical Snow Storm IPA. This beer is unlike any other IPA I have ever tasted. The first pour gave off a sweet scent which Mrs KB and I both thought was reminiscent of lychees. But the beer itself is not flavored and the tropical scent was all hop driven. It reminded me of the grapefruit flavor in Uinta Wyld (reviewed here http://kosherbeers.blogspot.com/2011/09/sunday-night-suds-uinta-wyld.html) which also makes you think that it has added flavor, but does not. Another difference in this brew is that it is an unfiltered IPA, which is something that I can't remember seeing or tasting before. Although hefeweizen and American Wheat beers are commonly unfiltered, I don't recall ever seeing that in an IPA. The beer was not as sweet as it smelled, but that is not a bad thing. It was floral and hop forward and it went well with Mrs KB's cranberry chicken. Although the beer is 6% abv, I did not detect any alcohol flavor in the brew. The Tropical Snow Storm is only available in the 12 Beers of Winter mix box (2 per box) and does not appear to be sold in six or twelve packs on its own. I emailed Saranac to see whether it is available in six or twelve packs outside of the NYC area, but they never responded to my email. 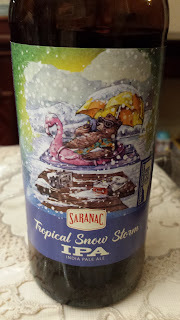 Saranac Tropical Snow Storm IPA is under the Kosher Supervision of the Va'ad of Detroit as is every other beer produced at the Matt Brewery plant in Utica, NY. Keep in mind, Saranac has begun to brew many different varieties off site, so check bottles for kosher certification from the Va'ad of Detroit. To see what the experts on Beer Advocate think about the brew, please follow this link www.beeradvocate.com/beer/profile/99/307405. woops I left a comment on the wrong post..